I was so inspired by the yarn I used to make Leah’s hat, I had to keep knitting with it. I usually knit socks and mitts on size 3mm needles, so using 5mm and larger was a real treat. Things grow fast when you use thick yarn and large needles. Duh. I am in love with the Feather and Fan lace pattern. In fact, I’ve been dabbling with it for a while. The knitting magazine I received in my stocking this year contained an article about the Feather and Fan patterns and all the delightful variations on the theme. There are dozens. If you haven’t yet explored it, consider doing so. It is simple and elegant– of the four rows of the pattern, only one row requires you to pay any attention at all — with a series of rhythmic k2togs (knit two together) and yos (yarn overs). The article ended with instructions/ideas for making items with this pattern. One of them was a cowl. Hence, I grabbed the rest of the placid waters yarn and another similar bundle — coal harbour, all from Sweet Georgia Yarns, and cast on. The nice thing about making a hat or a cowl, is not only that it goes by quickly, but it is that you only have to make ONE. You can make changes and additions and variations, and unless you are trying to design a pattern, you don’t have to worry about repeating it. Just create as you go. It’s like free form drawing. Here it is right near the end when I started thinking about taking photos. In this last view you can see the effect of the skirt. 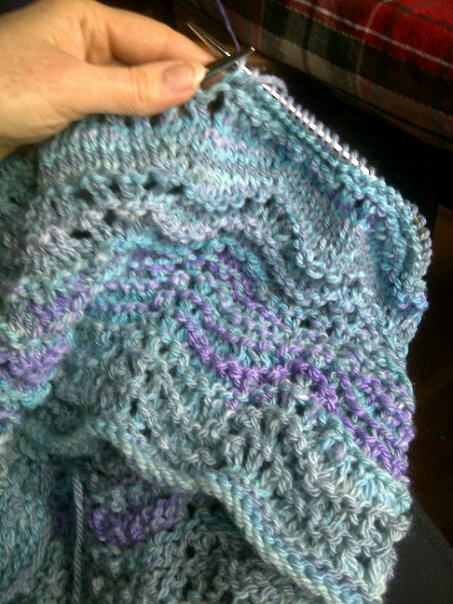 I have cast on again, planning another Feather and Fan lace cowl, but this time making it much more snug. The Feather and Fan lace has quite a bit of stretch, so it will fit over the head even if it more snug around the neck. Stay tuned. I am on holidays and have all the time in the world for knitting and playing around with fibre. This entry was posted in 3-ply yarn, cowl, feather and fan lace, handspun yarn, knitting, Sweet Georgia Yarns on December 29, 2011 by DianaTwiss. Last minute gift. . . . I wanted to make a special gift for my son’s girlfriend. So I looked through my stash and found some yarn that I made from Sweet Georgia Yarn fibre club (in fact I wrote about it in a blog post a while back). The colours were perfect for her — Placid Waters is the name of the colour way. Last year I made her mitts, so this year it had to be a hat. The yarn is a worsted/chunky weight, so it was just right for the pattern I had in mind. The pattern is called Foliage by Emilee Mooney and you can get it on Knitty.com or here. Knit on size 5mm needles, the hat knits up quickly — 1 1/2 days. Seriously, I could have knit it in a single day if I had to. (As far as my aspirations about 100 mile wear go, this one is not Triple A. It’s a B+. I spun the yarn and knit the hat. The fibre is from Sweet Georgia Yarns, a local fibre artist — who does all the dyeing in her studio downtown). Here’s a close-up of the hat. The yarn 50% merino, 25% bamboo and 25% silk is wonderful stuff. The colours are rich and the sheen from the bamboo and silk give an elegance you wouldn’t expect in a chunky yarn. It’s a beautiful pattern and easy to knit. It may look tricky becasue of the lace work, but it is a straightforward pattern. You can read this lace easily, so if you happen to lose your place in the pattern — jumping up to answer the phone, to take some tourtiere out of the oven, to help with an arrival of groceries that are coming in the door, you can clearly see what you need to do next. And here it is, modeled first by Georgia Rose and then by Leah. This entry was posted in 3-ply yarn, Emilee Mooney, handspun yarn, Sweet Georgia Yarns on December 29, 2011 by DianaTwiss. Happy December everyone. By the time you read this it will be the first of the month and therefore time to start decorating for Christmas. I know these stockings may seem like a large project, but believe me, they knit up very quickly. These stockings are all knit with my locally sourced hand spun yarn — with the occasional blast of novelty yarn thrown in. I was inspired to make these Christmas stockings by desire to have a unique gift for every member of my family. As a sock knitter, I really enjoyed making these stockings. 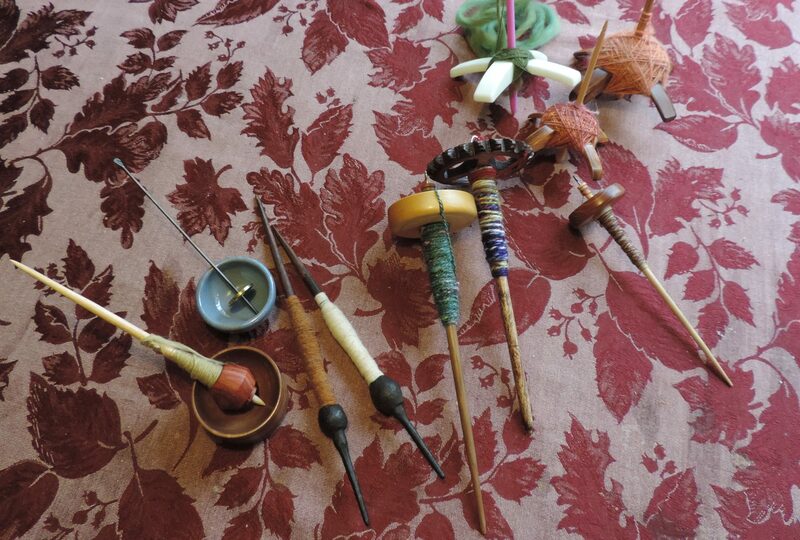 First, they are knit on large needles so they work up really fast. Second, it’s a great way to use up all those left over mini balls of yarn that build up in a knitter’s stash each year. And finally, because you are making each one to be unique, you don’t have to stress yourself by trying to match the second sock! The bells add a sense of fancy and Christmas joy. But you must be careful on Christmas Eve; their gentle jingling will give you away! You don’t need to buy chunky weight yarn to make these; in fact they look much better when you create a chunky weight yarn by combining 2 (or more) strands of DK weight yarn. When you do this you have a better chance to play with colour and texture. And don’t worry about making it all the same yarn weight. If you look closely at the red/white/and green stripe stocking at the end of this post, you will see how it bulges out at the green stripe. That is because that was knit with a hand spun super chunky weight and I used it because I needed some green. I liked the affect because it reminded me of a stocking that would be used in a Dr. Seuss book. I hope you enjoy making these. Here are some of the details and the pattern can be found through the link below. Size: measurement from cuff to heel – 14 inches; from heel to toe 10 ½ inches. Yarn: assortment of #3 DK light worsted yarns in Christmas colours like red, green, white. The addition of other colours like orange, pink, blues and textured yarns with sparkles, add to the uniqueness. The yarn will be doubled throughout to make a chunky yarn. Patons Classic Wool, in a series of colours, held double, will do the trick as will your hand spun yarns. You will need a total of 200 grams of yarn. This pattern is available for free on Ravelry. Let me know what you think. 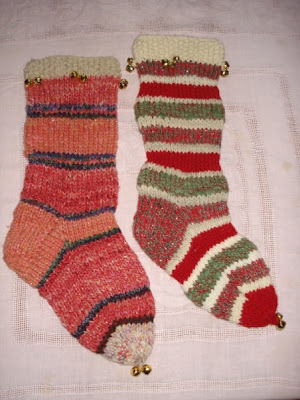 This entry was posted in christmas stockings, handspun yarn on December 1, 2011 by DianaTwiss.